This is a big game for Manchester City who are looking to qualify to the UCL round of 16 for the first time. Man City know that the first place in the group is going to Bayern, and that the only other contender for second place is Moscow's CSKA. Manuel Pellegrini, the City coach, is going to go all out to win this one. And so will the Russian side. Man City are on their toes. After the defeat to Chelsea in the English League Cup, Joe Hart, the England international number one, has been benched and the team has responded. They beat Newcastle 0-2 in the cup and then sank Norwich 7-0 at home in the league. If they beat Spartak again in the UCL on Tuesday, Sergio Aguero and company are free sailing. 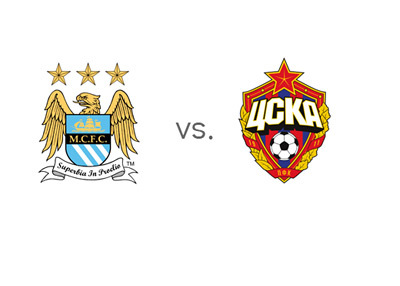 The score in Moscow, two weeks ago, was 1-2 for Manchester City. Manchester City are hugely favoured to win this match. A 100 € bet on City could return 16 € in profit, while the same bet on CSKA could return 1,500 € in profit. Sergio Aguero is the favourite to score at 8/13, Dzeko is at 8/13. Ahmed Musa is the favourite to score for CSKA at 11/2. Are Manchester City a serious contender in the UCL this year?